The major reason behind the subsidence in Mekong Delta is the overexploitation of underground water. Reports show that the average subsidence rate in Mekong Delta has been 18 centimeters over the last 25 years, while the rate is up to 30 centimeters in some places. As the subsidence continues and becomes more serious, scientists have called on to take action to save the delta. The Government Office on March 27 conveyed PM Nguyen Xuan Phuc’s instruction to take reasonable measures to mitigate the subsidence speed in Mekong Delta. For a delta created by alluvial river sedimentation, there are three reasons behind subsidence. First, natural causes. If the Mekong river runs naturally, it will bring alluvium to raise the level of Mekong Delta, thus offsetting the subsidence. However, according to the Mekong River Commission (MRC), the volume of silt brought to Mekong Delta dropped by 50 percent in 1992-2014, from 160 million tons per annum to 85 million tons. The figure is expected to decrease further as a result of the appearance of hydropower dams. Second, the weight of the construction works that press the ground. However, the effects are only seen in large urban areas. Third, the overexploitation of underground water. This is believed to be the main reason leading to the subsidence. The Mekong River is situated at the end of Mekong River basin with the annual water flow of 475 billion cubic meters on average. In the Mekong Delta, the rainfall is 1.4-2.0 meters of water, making up 11 percent of total water of the Mekong River. In the world, the Mekong ranks third in terms of annual water volume, after the Amazon, Congo and Chanjiang, and 18th in terms of water flow (cubic meters per second). However, instead of using river water, locals now prefer underground water. They think underground water belongs to everyone and they can use for all purposes – daily use, crop watering and shrimp pond dilution. Even during the six months of rainy season, people prefer using underground water, because rivers have become seriously polluted, while rainwater is no longer ‘clean’. According to Nguyen Huu Thien, a respected independent expert on Mekong Delta ecology, reducing the exploitation of underground water would be the best solution to subsidence. To do this, it is necessary to find water sources during the dry season. Local authorities could build water supply works to provide river water to people. Meanwhile, households could build tanks to store rainwater. 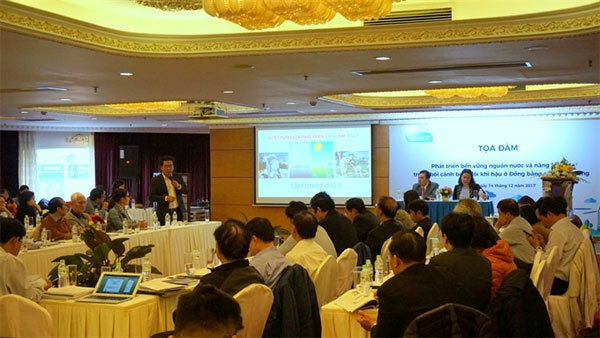 Thien suggested using technologies to turn sea water into fresh water. Also, it is necessary to upgrade river water quality to ensure supply for the long term.